Belva Lockwood grew up on a farm in upstate New York where she wasn't afraid "of snakes or rats or nothing." She grew up to prove that. Ignoring her father, she packed up and went to college, fought for a girl's right to take public speaking and physical education classes and went on to get into law school, graduate and fight to get her diploma. In 1879 she became the first woman to argue a case before the U.S. Supreme Court, turned her eye on getting the vote for women, and ran as a candidate for the U.S. presidency. A story of a gutsy woman who knew no limits and expected none, told through the voice of story that makes her feel like a bit of a tall tale heroine. Wonderful to introduce her to our girls and our boys so they can understand the path of gender equality. Would make a great pairing with Girl Running. Today was International Women’s Day. To commemorate the event, The New York Times published a piece entitled “Women We Overlooked in 167 Years of Obituary Writing.” The Times included fifteen women in the article, all fine choices including Ida Mae Wells, Charlotte Brontë, Ada Lovelace, and Emily Warren Roebling. The Times could well have also included Belva Lockwood. I know that from reading the illuminating picture book, A LADY HAS THE FLOOR by Kate Hannigan and Alison Jay. Alison Jay’s illustrations, with their crackle-varnish finish, have such a distinctive style that, from a mile away, you can tell that a picture book is her work. I’m very fond of her style, and was drawn to this book in the Women’s History display of my local independent bookstore. Reading it, I was excited to discover one more great woman hero in our national history. Starting on a farm in upstate New York, Belva Lockwood’s journey involved a lot of men telling her no. Women are better off today thanks to Belva Lockwood refusing to be deterred. Ms. Lockwood spoke out for equal pay as a teenage teacher who was paid half the wages of her male counterparts. She later fought to get into college and then fought for equal opportunities for the few women there. (You’ll be astounded by the jaw-dropping details.) She then fought to get into law school and fought for equal opportunities for women there, too. Are you starting to get the picture? This lady really stood up for herself and was one helluva fighter for women’s rights. 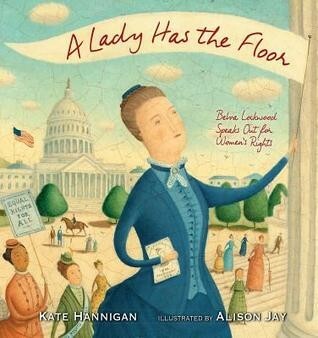 Many of Alison Jay’s wonderful illustrations include quotes from Belva Lockwood. The source of each quote is listed in the extensive backmatter. You’ll enjoy meeting Belva Lockwood. Perhaps The Times will include her in next year’s commemoration.